ACS has been the industry standard for modifying glazed creosote since it was first introduced in 1982. It’s an easy to use liquid manganese catalyst. ACS improves safety and efficiency in wood or coal burning stoves, furnaces, boilers, fireplaces and pellet stoves. Daily use during the heating season will improve heat transfer through the appliance because 1/32” of carbon insulates the same as 2”of asbestos. 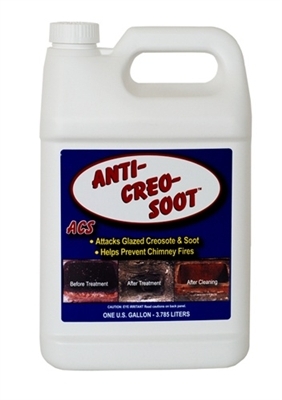 ACS attacks dangerous creosote and soot, helps prevent chimney fires, and makes the chimney easier to clean. It’s safe for use with catalytic combustors. Gallon liquid refill. The product itself is excellent, but the cost of shipping you charge is axhorbedent. $36.82 for the product and another $20.49 for shipping and handling, that's rediculous. it's not being shipped to Alaska! Last time I order from you. Shipment came sooner than expected. And, I needed it. Thanks! This product is the greatest ever invented. I am so pleased with this product and will continue to use it.